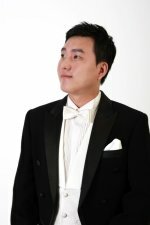 Eun Kuk began his vocal studies at the Seoul National University and continued at the Musikhochschule in Mannheim where he studied in the class of Professor Stefanie Krahnfeld and received his second Master’s degree in opera singing. Eun Kuk is a laureate of several international competitions. He won the 2nd prize in Osaka International Music Competition in Japan and the 3rd prize in the Korean Voice Competition in South Korea. His repertoire includes such operatic roles as Don Ottavio in Mozart’s Don Giovanni, Alfredo in Verdi’s La Traviata by Verdi, Duca in Verdi’s Rigoletto, Don Ramiro in Rossini’s La Cenerentolla, Rodolfo in Puccini’s La Boheme and Il Contino Belfiore in Mozart’s La Finta Giardiniera as well as a number of operetta roles: Alfred in Strauss’ Die Fledermaus, Barinkay in The Gypsy Baron and others. In 2014, Eun Kuk performed in Baden Baden Easter Festival with the Berliner Philharmoniker, singing the role of Chevalier des Grieux in production of Puccini's Manon Lescaut for children. In 2014 Eun Kuk was awarded the Richard Wagner Foundation Bayreuth Festival Scholarship.